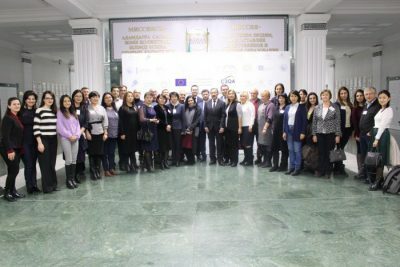 took place between October 16 – 17th, 2018 in Astana, Kazakhstan hosted by the project partner M. Narikbayev KAZGUU University. The conference was launched by the welcome speeches by Mr. Talgat Narikbayev, Rector of M. Narikbayev KAZGUU University who greeted all the participants wishing the partners enjoyable stay in Astana and successful outcomes of the conference. The participants were also welcomed by Mr. Miras Daulenov, Provost / Deputy Chairman of the Board, KAZGUU, who wished the conference participants nice stay in Astana and effective discussions and results in the framework of the conference. 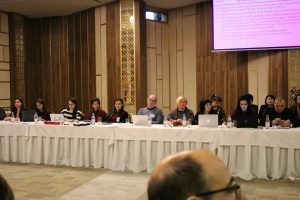 Afterwards, the state of affairs regarding the C3QA Project’s achieved outcomes and activities foreseen for the second half of 2018 and the whole 2019 were presented by Mr. Arayik Navoyan, Coordinator of the C3QA project, Vice-rector of UFAR. 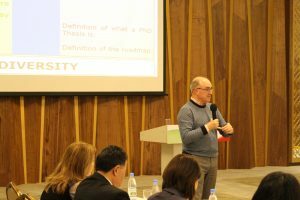 The conference was then continued by the presentation of Mr. Laureano Gonzalez-Vega, the international expert invited from the University of Cantabria (Spain) who addressed the global developments and trends on Quality Assurance of Cycle 3 (doctoral) programmes. 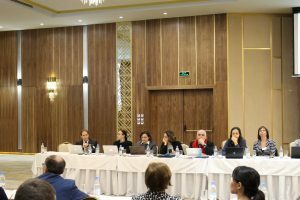 – internal quality assurance system for cycle 3 programmes presented by the representatives of the involved higher education institutions (Day 2). encouraging exchange of diverse knowledge and experiences gained from establishing quality assurance systems for cycle 3 programmes across and between countries. 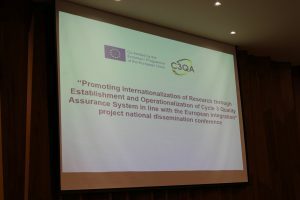 The presentations provided information on results of the work accomplished by each partner under the C3QA Project, specifically what changes and ammendments have been introduced into external and internal quality assurance systems for doctoral programmes and what proposals and recommendations have been made to legal frameworks regulating doctoral programmes at country level. Follow-up discussions provided the participants an opportunity to ask questions, share opinions and receive feedback and were led by one facilitator responsible for resuming major points made in the discussion. 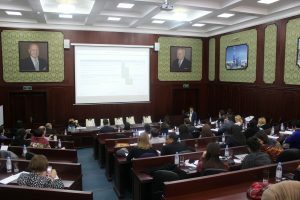 The Astana dissemination conference targeted policy makers, staff of higher education and research institutions involved in organization, delivery and quality assurance cycle 3 (doctoral) programmes. The students involved or intended to be involved in doctoral studies are considered as important stakeholders and beneficiaries of C3QA project and of this dissemination conference in particular. 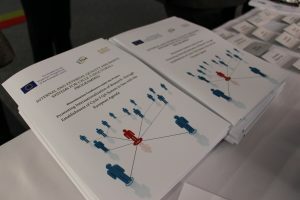 The 5th Coordination meeting of the project took place on the 17th October, 2018 addressing several areas of discussion, in particular: follow-up of recommendations of EACEA Implementation Report, activities for the year of 2018, activities for the year of 2019, state of project finances and day-to-day management, issues regarding dissemination conference in Ulaanbaatar, organization of site-visits and pilot accreditation, and project communication.